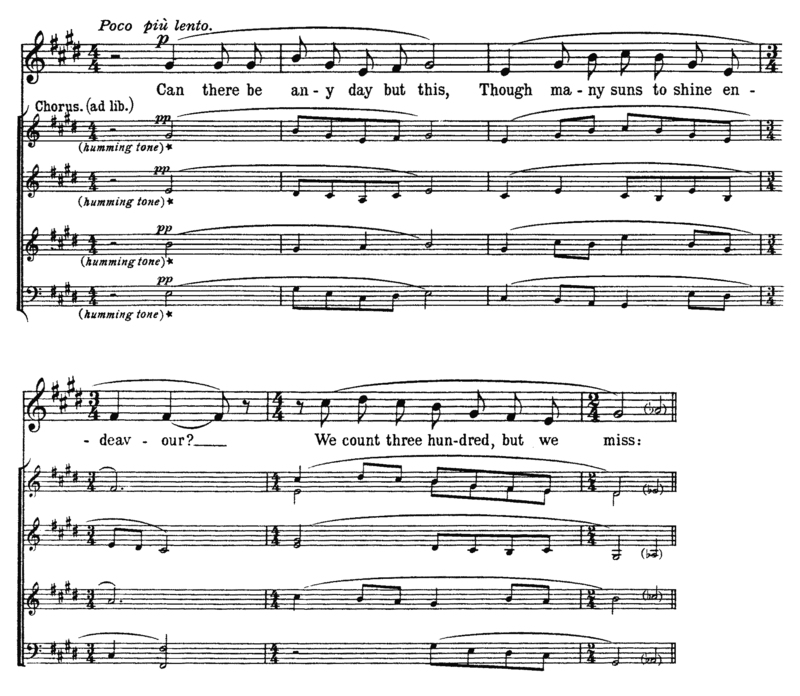 Note the similarity to Holst’s score indication for Sāvitri, “They are to sing throughout to the sound of ‘u’ in ‘sun.’” 3 In this song, the chorus only hums these two phrases before joining in with the soloist for the last phrase of text, “There is but one, and that one ever.” Here the [wordless] chorus functions as instrumental color, a different timbre, like an organ stop, and does not play a dramatic role. Ultimately, the Five Mystical Songs are more striking for what they foreshadow than for what they achieve. Wordless chorus appears as dramatic vocalization in Vaughan Williams’s Pastoral Symphony (1921), Flos Campi (1926), Riders to the Sea (1936), the film score to Scott of the Antarctic (1948), and the ensuing Sinfonia Antartica (1952). Also, a musical motive included in the third of the Five Mystical Songs recurs in many of these same pieces. 1 Hubert J. Foss, Ralph Vaughan Williams: A Study (New York: Oxford University Press, 1950), 106. 2 Ralph Vaughan Williams, Five Mystical Songs (London: Stainer & Bell, 1911), 13–14. 3 Gustav Holst, Sāvitri: An Episode from the Mahabharata, op. 25, 1. 4 Ralph Vaughan Williams, Five Mystical Songs, 19. 5 Hubert J. Foss, Ralph Vaughan Williams: A Study, 107. 6 Ralph Vaughan Williams, Five Mystical Songs, 16.